Simple is sometimes better, particularly with a premium on space. With a tight, snug cover you can avoid tripping hazards or a cluttered appearance. Instead of draping all the way to the ground, the table cover model clings to the top of the table. This leaves the table legs exposed and visible. 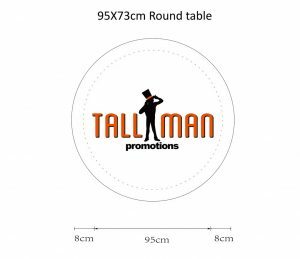 These covers are available in multiple shapes and sizes to fit any table. Sometimes table covers can drape in an irritating way if the wind picks up at an outdoor event. An elastic table top cover won’t shift, ensuring it looks professional at every event. Avoid hazards from extra material or weather problems with a tight fitting table top cover. The last thing you want is to spend your event cleaning up your booth, stretch table covers take away from many of these risks. If you have any more questions feel free to contact us. Stretch Table covers are made using 180g Stretch Polyester. These table covers work for round or rectangular tables. 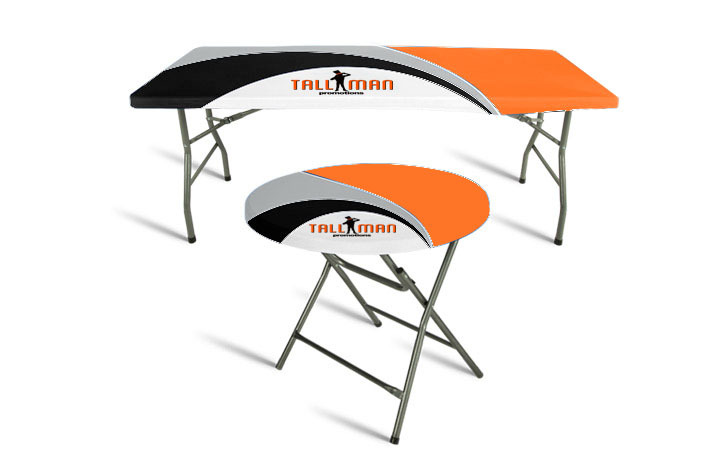 We have five table top covers available to fit your needs for your specific table.